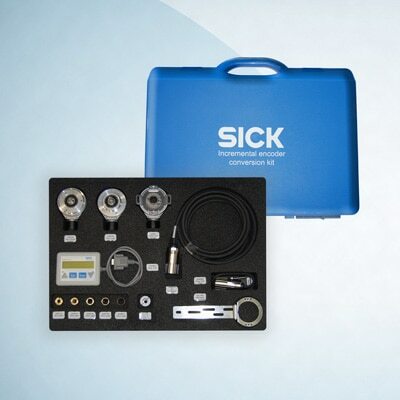 With the Incremental encoder conversion kit SICK provides you with the tool kit to help safeguard your production process from lengthy unscheduled machine downtime. Wherever there is a need to control motion you will find an incremental encoder. These often overlooked components are an essential part of the machine operation. Normally buried inside the machine they work reliably for many years, but when they do reach the end of their operational life, the process won’t run properly until an appropriate replacement is fitted. The SICK incremental encoder conversion kit provides you with the necessary parts to replace over 90% of incremental encoders from a wide range of manufacturers – quite an accomplishment given the millions of options OEM’s can select from when choosing an encoder.